This past weekend we went on a road trip down to Cedar City to visit my little sister Taylor and her hubby Abbel. This is Taylor and she is pretty much a rock star at SUU (I kinda had no idea). She spends her days super busy doing totally fascinating things. She and her hubby have their own radio show on Monday evenings on SUU's radio station Power 91. As part of her Power 91 responsibilities, she gets to host the half-time shows at all of the sporting events (volleyball, basketball, football, etc). We got to watch her in action at one of the volleyball games and she did an amazing job. Taylor called my dad and I out onto the floor during a time-out at the volleyball game to participate in a bumping competition and we WON!!! Yay! We each won a pizza. Taylor also produces and co-hosts her own television talk show for SUU. Bryson and his cousin Zoey had fun being silly on the set. She also anchors the SUU news. 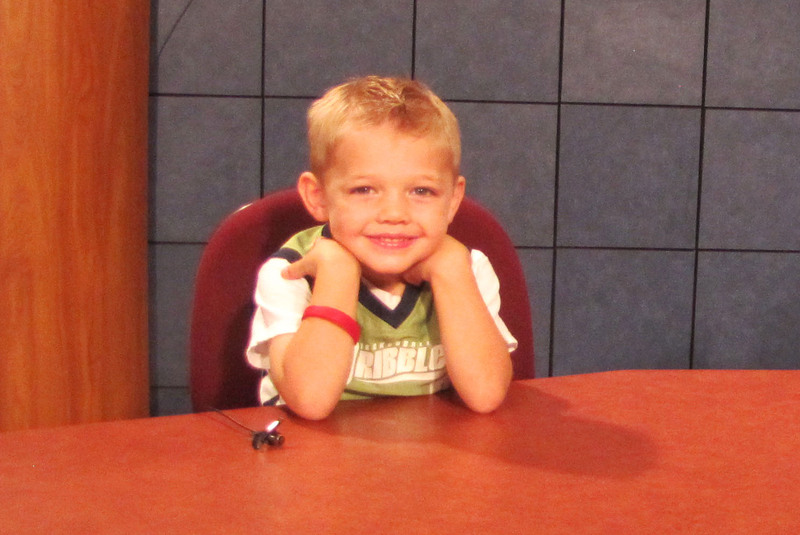 She gave us a tour of the news studio and then we all took turns anchoring the news with her. Even Bryson got to have a turn. We all helped in the control room and got to learn how to run the teleprompter. Then we went over to the football field to watch Taylor's hubby Abbel (#15) play in SUU's homecoming football game. We all sported our SUU gear. My cute nieces and I all wore the same shirts. Taylor was busy during the game running all of the sound for the game up in the press box. SUU dominated UTSA with a 45-22 win!!! Way-to-go Abbel!! !